My seven-year-old son has a molar with extensive decay. Our dentist wants to repair it with a stainless steel crown. Couldn’t she pull the tooth instead or even leave it alone since it’s only a baby tooth? Many people wonder why a dentist would recommend restoring a badly decayed baby tooth instead of extracting it, or even waiting for it to fall out on its own. After all, it will be replaced with a permanent tooth eventually, so why go to so much trouble? The fact is, it’s best to save primary teeth whenever possible because they serve important functions. Through all the years they are present (and the last ones may not be lost until around age 12), they help children eat, speak and smile properly. They also act as placeholders for permanent teeth: If some primary teeth are lost before they would come out naturally, the permanent teeth may be crowded or crooked. The primary molars generally fall out around age 10-12, so your son has several years to go before they are replaced by permanent ones. When a diseased tooth is not treated, the decay may spread to neighboring teeth—including the permanent tooth that has not yet emerged. An infected tooth can be painful, and in extreme cases the spread of infection from an abscessed tooth can be serious, even life-threatening. Thus treatment is very important, and a stainless steel crown may be the best solution for a tooth that is too badly damaged for a regular filling. Stainless steel crowns, which we like to call “silver hats” in my practice, have been used in dentistry for 70 years and are the most common type of crown for children. They are often used in primary teeth that have extensive decay over multiple surfaces, and on teeth that are broken or have a significant defect either from birth or due to disease. Although they cost more than a traditional silver-colored filling, stainless steel crowns last longer and are the least expensive type of dental crown for children. A 2017 study published in the Journal of the American Dental Association reported a 6 percent better survival rate for stainless steel crowns after 3 years when compared to fillings, especially when the crowns were placed by a pediatric dentist. These findings support previous studies confirming the increased longevity and reduced need for re-treatment of teeth with stainless steel crowns versus multi-surface fillings. Most pediatric dentists (those who specialize in children’s dental issues) consider this tried-and-true dental restoration the treatment of choice for a child’s back teeth. Stainless steel crowns are stronger and more durable than large fillings, making them ideal for molars, which must withstand substantial chewing pressure. However, they are not a good choice for front teeth because of their noticeable silver color. There are more aesthetically pleasing options for teeth that show when speaking and smiling; but tooth-colored alternatives that are strong enough to endure the workload of molars are significantly more expensive and require more time in the dental chair. 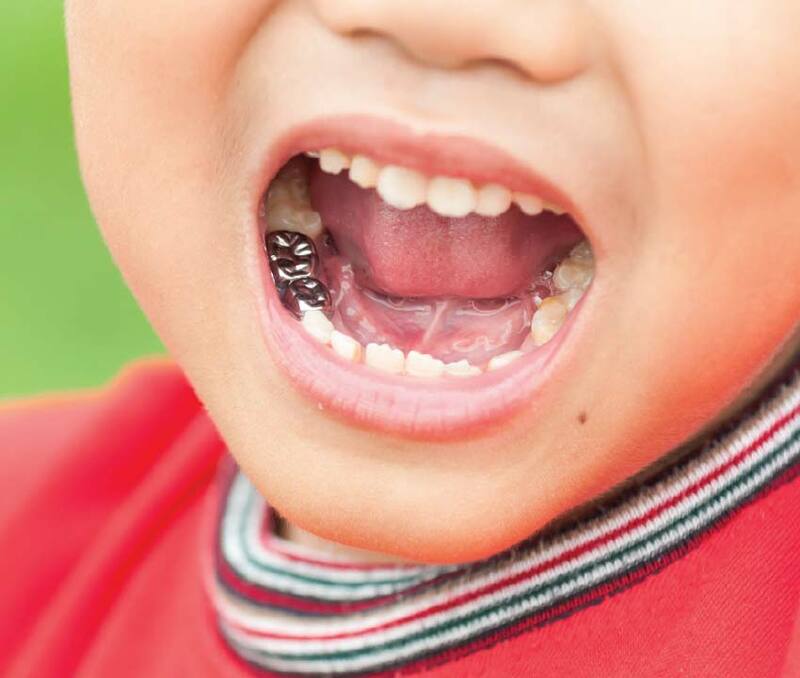 The stainless steel cap (crown) functions like the natural crown of the tooth, allowing children to eat and speak comfortably and helping their bite to develop properly. The crown will stay in place until the baby tooth falls out. Stainless steel crowns generally require only one visit to the dentist and rarely need to be repaired or replaced. These pre-formed metal caps come in different sizes and can be customized for any tooth. After the damaged or decayed portion of the tooth has been removed, the crowns fit over the remaining tooth structure and fully cover the tooth. If tooth decay extends to the pulp inside the tooth, however, the infection may need to be removed first. This may be done via a procedure called pulpotomy or pulpectomy, which is similar to a root canal but appropriate for children. Stainless steel crowns are stronger and more durable than large fillings, making them ideal for molars, which must withstand substantial chewing pressure. Your child’s dentist will select the right size crown, tailor the metal shell to the tooth, and cement it in place. Typically, local anesthesia is used for crown placement, although additional sedation options may be available. For example, nitrous oxide, commonly called “laughing gas” is a safe and mild option for children who are nervous about dental procedures. Getting a stainless steel crown is a routine procedure, but after treatment your child should refrain from eating until the anesthetic has completely worn off to avoid injury to the cheek, lip or tongue. Your dentist may recommend an over-the-counter medicine if there is any discomfort after the procedure. Our goal is to recommend the best treatment option for the health of the baby tooth and the permanent tooth underneath. Stainless steel crowns are a long-lasting and cost-effective way to preserve a primary tooth so it can guide the permanent tooth in correctly.